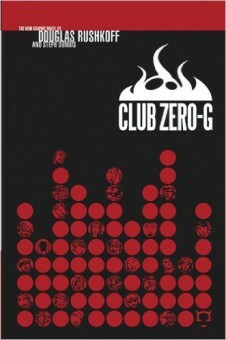 Buy Club Zero-G on AmazonBuy Club Zero-G on Barnes & NobleBuy Club Zero-Gon iTunesBuy Club Zero-Gon BAM! Teaming with Canadian independent comic artist Steph Dumais, Rushkoff has delivered a mind-altering journey into a universe where consensus reality is up for grabs. The story follows Zeke, a gangly, unpopular, 19-year-old college student – a townie who also happens to attend the elite college in his community – who has discovered a terrific new club where he is accepted and popular. There’s only one catch: everyone at the club is dreaming. It only exists in the shared dream consciousness of its participants. If at all. For there’s the rub: Zeke’s friends think he is simply going crazy. His girlfriend in the club won’t even acknowledge his existence in real life. As Zeke descends further into the ClubZeroG reality, he learns that this shared dream space is actually a psychic field created by four mutant children from the future – the last of their kind, conceived by human space travelers in zero gravity and exhibiting strange deformities and abilities. Living in a future where independent thinking is considered a threat to “consensus,” they are hunted by the authorities, and seek the help of teens from the 21st century who, they hope, can still alter the course of reality. But Zeke eventually learns this is all a set-up, and he is being used by the militaries of the present and the future as a portal into the psychic field of the ZeroG kids, so they can be destroyed. Unless, of course, he is just going mad. The battle for Zeke’s mind becomes an interdimensional battle for reality itself, in this daring, adult, American, anime adventure.